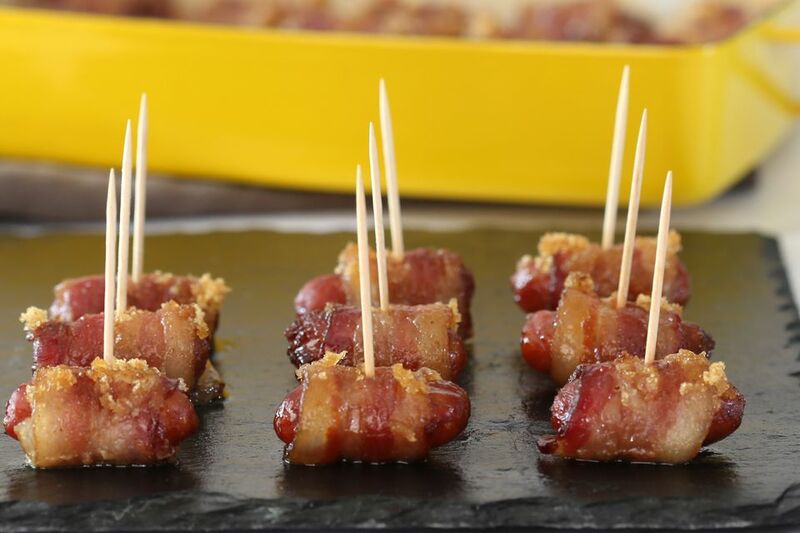 These bacon-wrapped appetizers offer the perfect balance of sweet, salty, and smoky. Whether for a grown-up bash or kids party, they're sure to be a big hit. Even the most discerning guests will fall for these delicious little bites, so be sure to make a big batch! While the little smokies need no enhancements, you might want to serve them with a sauce. Plain yellow mustard or a Dijon mustard-based dip are excellent options. Or offer warmed barbecue sauce or ranch dressing for dipping. For serving, transfer the baked wrapped smokies to a slow cooker or chafing dish or arrange them to keep them warm. You may use little cocktail wieners or sliced standard hot dogs or smoked sausages in the recipe as well. The little smokies make a tasty main dish as well. Serve them along with roasted potatoes or fries for an easy and delicious family dinner. Each package of smokies, depending on the brand, contains about 3 to 3 1/2 dozen mini sausages. Feel free to scale the recipe up for a large party or potluck. Line a rimmed baking sheet or baking pan with foil or parchment paper, if desired. Unwrap the cold bacon and slice the whole slab crosswise into thirds. Separate the bacon pieces. Wrap a piece of bacon around one of the little smokies and place it in the prepared pan, seam side down. Alternatively, you may secure each one with a toothpick. Repeat with the remaining little smokies and bacon pieces. You will probably have extra bacon—save it for breakfast the next day. Sprinkle the brown sugar evenly over the bacon-wrapped little smokies and then top them with a dash of the cayenne pepper, if using. Bake the bacon-wrapped little smokies in the preheated oven for about 45 to 55 minutes, or until they are golden brown and the bacon is slightly crisp. For Tex-Mex flavor, combine the brown sugar with 2 teaspoons of chili powder, 1 teaspoon of ground cumin, and 1/4 teaspoon of cayenne pepper. Sprinkle over the bacon-wrapped little smokies and bake as directed. Top each of the bacon-wrapped little smokies with a small piece of pineapple and secure with toothpicks. Sprinkle with brown sugar and bake as directed. When planning a cocktail party or game day gathering, consider the number of appetizers you will be serving. Offer about 3 to 5 types of appetizers for 8 to 16 guests. Generally speaking, each guest will eat about a dozen appetizers over the course of 3 to 4 hours. For a dinner party, plan on 2 to 3 appetizer items and about 5 or 6 appetizers per person.